Nazis have been a staple antagonist in videogames for as long as avatars have held guns. These enemies are usually just fodder, existing purely to be shot… If only we could talk to the Nazis, eh? Eh? [Look, I wasn’t even on the magazine at the time. Stop these swipes now, Kirk – dep ed] Well, Wolfenstein: The New Order just about adopted this centrist fantasy, letting us eavesdrop on German soldiers as we scout out bases, and even forcing us to serve them drinks aboard a train bound for Berlin. While there’s still plenty of time dedicated to blowing Nazis into manageable, meaty chunks, The New Order is surprisingly heartfelt in its downtime. This ethos will carry into the forthcoming sequel, The New Colossus. 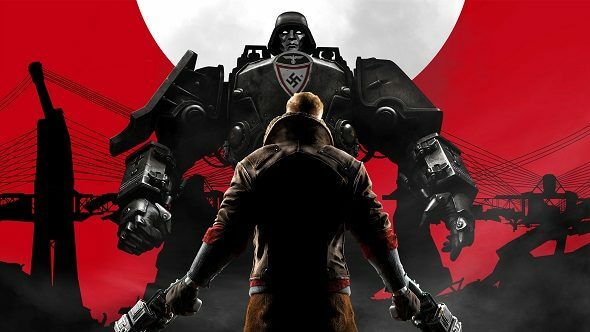 Here’s everything we know about Wolfenstein: The New Colossus. 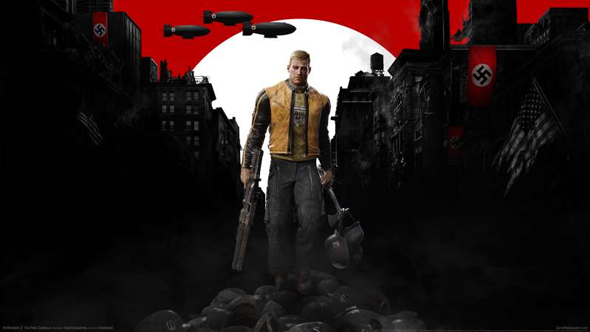 Not only is it fleshed out with a cast of complex, pained characters, Wolfenstein dares give us a peek into the awful Nazi regime’s twisted ideology, albeit through a lens of absurdity. Just as it’s viable to crouch around a corner and listen to Nazis complain that they’re actually the ones who are persecuted, you can just as easily wade in with an LMG in each hand and pop off their helmets in a hail of lead. The game opens with you murdering Nazis from a wheelchair, for god’s sake. Ridiculous as it is at times, MachineGames don’t think Wolfenstein is a joke. However you feel about that blend of the cuttingly real (especially in today’s world) and the ridiculous, there’s no denying that MachineGames are responsible for one of the best attempts at perfecting this balance in videogames. They’re not the first to try it in games, of course. And, over in the world of film, there have been both successes and failures at creating this marriage of biting political satire with over-the-top violence and absurdity. When it was announced we were getting a modern Wolfenstein I don’t think anyone expected it to be what it is. Most probably assumed it would be a dumb shooter with dumb characters – Duke Nukem vs fascists. There’s much more to it, however. It feels like it’s a game with something to say. One that isn’t trying to be apolitical. It’s funny, because when development on the project began there was no way MachineGames could predict the state of the world in 2017. Still, catharsis! It’s going to be as thematically cohesive as you can get, basically. 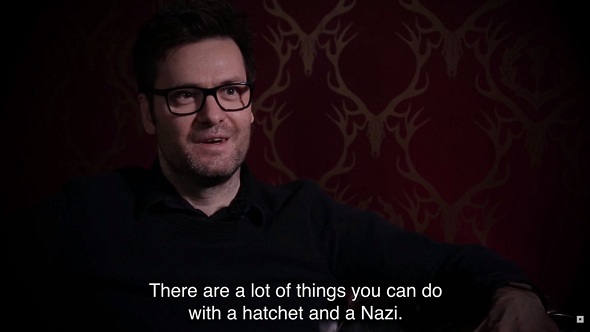 Of course, this alignment with modern politics was just a coincidence, though it helps that MachineGames refuse to hold back in their depiction of Nazis as they were.